Simpsonville City Hall is located at 118 Northeast Main Street, Simpsonville, SC 29681; phone: 864-967-9526. Photo: Hopkins Farm, ca. 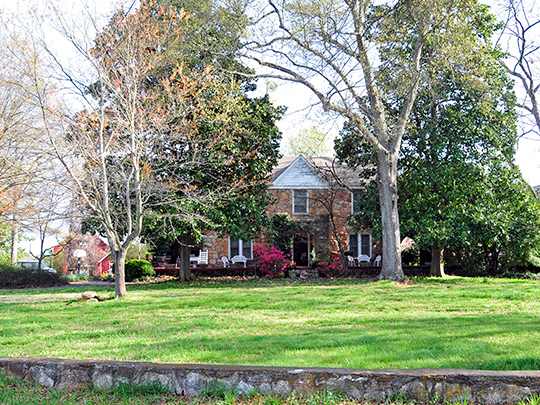 1840, 3717 Fork Shoals Road, Simpsonville, SC. Listed on the National Register of Historic Places in 2007. Photographed by User:Bigskybill (own work), 2012, [cc-by-3.0 (creativecommons.org/licenses/by/3.0)], via Wikimedia Commons, accessed January, 2014. In the 1820s the area that would become Simpsonville was a stagecoach stop 12 miles south of the Greenville Courthouse. It was operated by Thomas Goldsmith. In 1836 Silas Gilbert opened a general merchandise establishment at the crossroads. In 1838 Peter Simpson set up a blacksmith shop; the same year a post office, named Plain was opened in a house occupied by Jarrett Cook.